Previous two articles, "ACPI AML Debugger in Ubuntu 18.04" & "Debug AML (DSD & SSDT) with ACPICA Utilities", discuss techniques for AML, debugging; however ACPI specification includes many other important tables than DSDT and SSDTs. While other ACPI tables include fixed fields and lengths, it doesn't mean their contents cannot go wrong. In fact, many systems in the field have many incorrect ACPI tables in their firmware. This can happen when systems are developed by integrating code from various parties without modified for customized hardware. A test suite is a good solution to catch errors without involving too many engineering resources as it can identifying errors automatically or semi-automatically. In particular, Firmware Test Suite (FWTS) is one of the best test suite (did I also mention it is freely available too?) and it is the recommended ACPI test suite by UEFI forum, who is the owner of ACPI specification. What is Firmware Test Suite (FWTS) ? Firmware Test Suite (FWTS) is a test suite that performs sanity checks on firmware. It is intended to identify BIOS, UEFI, ACPI and many other errors and if appropriate it will try to explain the errors and give advice to help workaround or fix firmware bugs. More information about FWTS can be found at its official website or in a previous blog. FWTS packages for Other Linux distros can be found here. Below is an example of how fwts was executed. More details of FWTS's ACPI tests can be found on its references website or by the command fwts --show-tests. FWTS also provides a way to execute all tests in a category. For example, sudo fwts --acpitests run all ACPI tests all together. A similar command is sudo fwts --uefitests (which will not be discussed in details here). FWTS is used for real projects. Here are some examples of tests we have run. Running sudo fwts fadt executes 6 tests that checks whether system firmware/BIOS implement FACP table correctly. Especially, the sizes of FACP table grow with ACPI specs, but some firmware/BIOS updates the FACP major and minor versions without adding the new fields in later ACPI spec. This can be caught by FWTS with ease. An example is Test 3 in results.log shown below. Another common error in system firmware/BIOS is ACPI table checksums. When built by AML compiler, ex. iasl, table checksums are updated accordingly; however, it is a common practice that system firmware/BIOS modifies tables for hardware customization during boot time and this can corrupt tables if firmware/BIOS does not update checksum fields accordingly. Below is an example of running sudo fwts checksum to verify the checksum fields of all ACPI tables. FWTS can analyze ACPI tables from other systems. This can be done with fwts --dumpfile=acpidump.log. More details will be discussed in the next blog. As expected, the intel-hid is used on this particular Dell system. Check Whether INT33D5 is "Present"
Alternatively, using acpiexec is easier for this task. Using acpiexec is the same as acpidbg, but it loads ACPI tables from files and runs AML in emulation mode, i.e. it does not touch hardware registers or actual memory. Tutorial of using acpiexec is the same as acpidbg and can be found in the previous blog. ACPICA is an open-source project that provides an operating system (OS)-independent reference implementation. It also contains a list of utilities such as ASL compiler (iasl), acpiexec (an AML emulator) and so on. However, debugging AML on Linux in runtime wasn't provided in ACPICA ... not until Linux Kernel 4.13. While compiling a custom-build kernel is nothing new to kernel developers, it is often inconvenient for system firmware / BIOS developers who need to verify ACPI AML implementation in their firmware. Fortunately, Ubuntu 18.04 (x64) and later enable these config by default, and one can simply execute acpidbg on Ubuntu 18.04 - even on Ubuntu Live from USB too! Example 1 - To determine AC power status in runtime. Evaluate _PSR when AC is connected. Example 2 - To determine battery information and status. Why cannot ACPI _REV object be used to detect Linux anymore? While it is obvious it was Windows which did not follow ACPI spec, nothing can stop BIOS engineers from mis-using _REV as a mechanism to detect Linux in BIOS ASL codes. After ACPI 6.0 was published, the corresponding changes are also made to Linux kernel - the evaluation of _REV now returns 2 in kernel 4.1 and later (for example, Ubuntu 15.10 with kernel 4.2). In order to provide backward compatibility, a new kernel parameter "acpi_rev_override" was introduced for those who still want to use _REV = 5 in their BIOS ASL code, but most of major Linux distributions do not include this kernel parameter by default, and it should be used with cautions. If you are using one of the systems with _REV in the firmware, you can develop a kernel patch to add your system to the _REV quirk list acpi_rev_dmi_table in drivers/acpi/blacklist.c as below, like the patch I submitted. DMI_PRODUCT_NAME can be identified by sudo dmidecode -s system-product-name. Many BIOS engineers are familiar with ru.exe in DOS and R/W everything in Windows. One frequently asked question is whether there is an equivalent utility in Linux. The answer is "sort of". 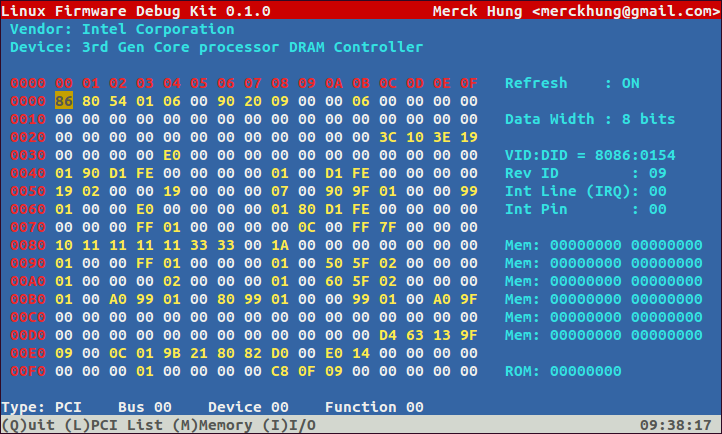 Linux Firmware Debug Kit (lfdk) provides read/write functions to PCI, IO and memory spaces. The navigation is to use arrow keys and hotkeys L, M and I to different spaces as instructed on the bottom of the lfdk. This is tested in Ubuntu Linux 12.04 to 15.04. One can also download the source code from sourceforge.net above.